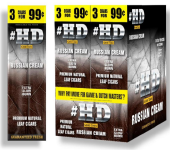 Good Times #HD Russian Cream Cigarillo Cigars 30/3's 90 cigars (High Definition) cigars are distinguished by their genuine, natural Connecticut Shade wrapper - something most similarly-priced cigarillos don't. 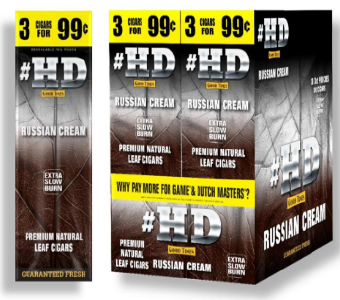 Combining the most select tobaccos with the best flavor technology in the U.S., Good Times #HD Russian Cream Cigarillo Cigars 30/3's 90 cigars are always super-fresh and ready to enjoy in 4 vivid flavors. With Good Times #HD Russian Cream Cigarillo Cigars 30/3's 90 cigars get a mild, sweet and satisfying smoke with a wonderful aroma. Order the Good Times #HD Russian Cream Cigarillo Cigars 30/3's 90 cigars that's right for you now! 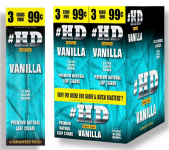 The Good Times #HD Cigarillos are made with both, homogenized tobacco and natural-leaf tobaccos, along with a state of the art infusion process and is top-quality machine made gems that will give you a blast of fruit goodness. Tasty, yet not overpowering, these gently infused cigarillos are sure to satisfy. Made with the best Central American short filler tobaccos wrapped in a genuine Connecticut shade leaf, you sure get a lot of quality at a very affordable price. 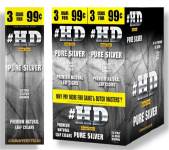 Good Times #HD Cigarillos are Foil wrapped for freshness, both Good Times varieties offer you exceptional value, exotic flavors, and a delightfully refreshing smoking experience that you won�t soon forget!